NEW YORK, NEW YORK, UNITED STATES, October 23, 2018 /EINPresswire.com/ -- As the online homecoming dress buying season concludes, Occasion Brands, LLC, releases Pulse of Homecoming to analyze the relationship between the fashion industry’s expectations for 2018 homecoming dress trends and actual consumer purchasing patterns. Pre-season, it was predicted that there would be a decline in 2018 sales of homecoming dresses in previously popular designs – two-piece cuts, prints, and off-the-shoulder necklines. Instead, an increase was anticipated in sleeveless a-line styles with v-necklines and unique back designs. Analyzing actual online consumer purchasing patterns postseason, it’s clear that these pre-season predictions were accurate. 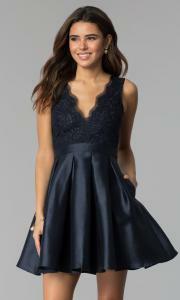 Navy, mauve, and burgundy were predicted to be the top-selling colors, and the majority of homecoming dress styles were expected to be affordably priced under $150. Consumer purchasing for 2018 homecoming dresses closely followed these business expectations set by designers. All of the top ten styles sold nationally were short a-line dresses priced under $150. The majority of the top styles sold had v-necklines, and the most popular colors were navy, mauve, or burgundy. Burgundy red, navy blue, and mauve pink, the predicted top-selling colors of the homecoming 2018 season, accounted for 65% of all online homecoming dress sales. Burgundy red represented 24%, with navy blue closely following at 22% and mauve pink not far behind with 19%. At 16% of total dress sales, black surprisingly took fourth place among the top selling homecoming dress colors, making it an additional top color that had not been anticipated for the 2018 hoco season. These four colors (burgundy, navy, mauve, and black) represented 81% of all homecoming dress sales. The data for these homecoming sales trends represents online orders placed in 2018 between August 15th and October 15th, across the United States at Occasion Brands, LLC, a leading national online dress retailer. Customers self report their online purchases as homecoming dresses upon placing their orders. For more information about Pulse of Homecoming, please contact: Ashley Binda at Occasion Brands, LLC, ashleybd@occasionbrands.com, 917-746-8323.